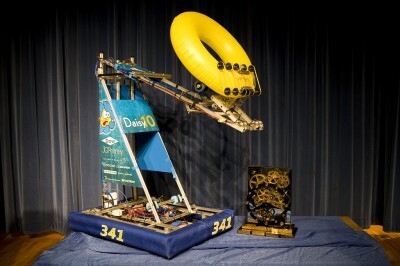 Going into the 2011 season, Miss Daisy set her sights on the technical aspects of the FIRST® Robotics program. The main focus was our robot’s prowess, agility, and speed. After a host of electrical difficulties at the Florida Regional, Miss Daisy X was able to pull together a valiant performance for the Philadelphia Regional, going 8-1 in qualification matches. 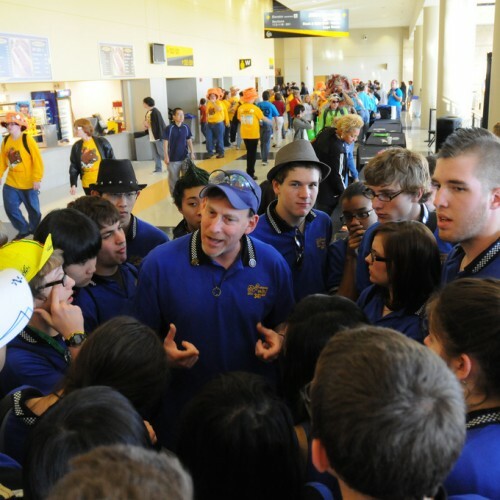 This season was not destined to bring in many wins for Miss Daisy, but we kept our spirits high by cheering other teams on, and enjoying FIRST®to it’s maximum at the Championships in St. Louis. 6 Wheel, 6 Motor Drive using 4″ diameter/2″ wide IFI wheels with Blue Nitrile tread (13 fps top speed; traction limited at stall). Turns effortlessly. The best drive train we have ever built. Arm shoulder joint can reach all scoring levels from the ground in less than 2 seconds, including scoring over the robot’s back. Dual gas springs keep the arm nearly weightless to the motor. Pneumatically articulated wrist deploys claw for pickup and retracts to protect it during transit. Wide sensor-controller roller claw powered by an RS-775 effortlessly picks up any tube, in any orientation, at any robot speed – all the driver has to do is touch any part of the tube. Geometry of the claw keeps the tube at a constant orientation. After 4 primary iterations and over a dozen minor versions, this is the best manipulator we have built. Entire claw can be swapped out in minutes. 2-step minibot deployment process (lock to tower, deploy minibot) that takes any chance out of deployment. In honor of the 20th anniversary of FIRST®, LOGO MOTION™ uses innertubes in the shapes of circles, squares, and triangles that make up the FIRST® logo. LOGO MOTION™ is played on a 27-by-54 foot rectangular field with four towers placed in a square in the center of the field. 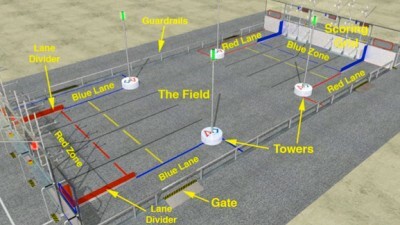 There is a scoring rack on either ends of the field with scoring pegs arranged in a 6 x 3 grid. Two alliances of three teams each use the various innertube parts of the FIRST® logo and hang them on the racks at either end of the field. Extra points are given to tubes scored over the yellow übertubes that can be scored in autonomous mode. Additional extra points are awarded if the tubes form the FIRST® logo. Tubes scored on the bottom row are worth one point, the second row two points, and the third row three points. During the last ten seconds of the match, robots deploy their minibots on to the towers. These minibots then race to the top of the poles. Points are awarded based on how fast a team’s minibot can make it up to the top. Minibots reaching the top of the pole earn 30, 20, 15, and 10 points according to the order in which they reach the top of the tower.